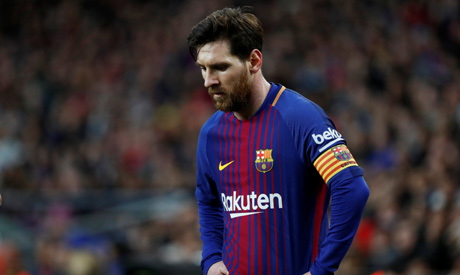 La Liga leaders Barcelona said Lionel Messi will miss their fixture at Malaga on Saturday due to personal reasons, with Spanish media reports saying it is due to the birth of his third son. "A last minute change to the FC Barcelona squad. Leo Messi has withdrawn for personal reasons and Yerry Mina takes his place," said the statement on the club's official website. It is the first time this season that Messi, La Liga's top scorer with 24 goals, has not been included in the matchday squad for a league game. He has started 26 of Barca's 27 games, while he came off the bench against Espanyol on Feb. 4. Spanish newspaper Marca said Messi's third son, named as Ciro, was born on Saturday. The Argentine and his wife Antonella Roccuzzo announced last October they were expecting a third child. Barca lead the Liga standings on 69 points, enjoying an eight-point lead over nearest challengers Atletico Madrid after beating the Madrid side 1-0 last Sunday with a free-kick goal by Messi.